Using the Rhubarb cordial I made the other day (recipe found Here) there are many cocktails you can make. I used these cocktails for a personal dining experience as a personal chef Sherborne, Dorset. One way to use the rhubarb cordial is just adding a splash to a champagne glass. You can then pour chilled Prosecco over the top and add a sprig of mint. Another way you could use it is in a mojito. Do this by combining mint and lime in a glass and mashing together with a muddler, or use the end of a rolling pin if you don’t have one. You then add a splash of the rhubarb cordial, a shot of rum, ice and then top it up with soda water. This makes a great refreshing drink during the hotter weather. There are many other cordials you could make to use in these same cocktails but updating it throughout the year tokeep this seasonal. During the Winter months you could use spiced winter berries such as elderberries with orange and blackberries. You could spice this with cloves and cinanamon and even heat this to create a mulled cocktail. For Autumn you could use something like pears or apples. 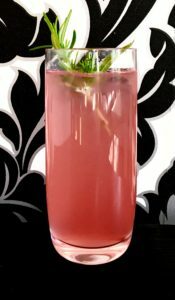 For Summer you could use rasaspberries or strawberries and in spring you could incorporate elderflower into these cocktails.